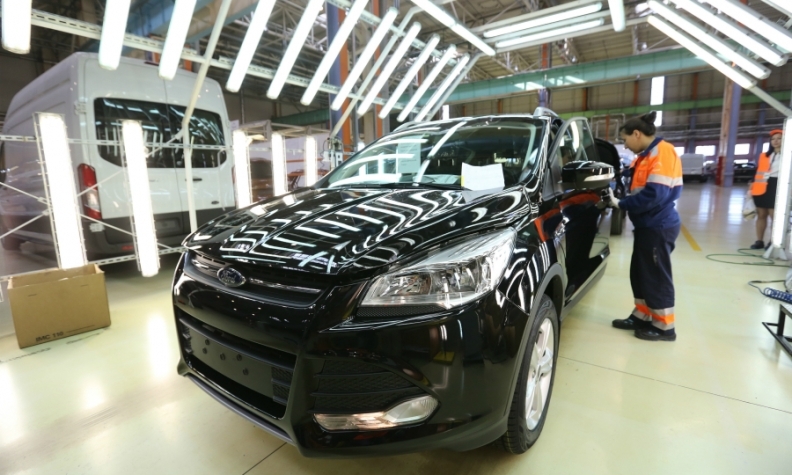 A worker examines a Kuga SUV at the Ford Sollers plant in Elabuga, Russia. MOSCOW -- Foreign automakers in Russia are benefiting from a stronger, more stable ruble, which is reducing their costs and supporting earnings in dollar terms at a time when the once-booming local market is expected to return to growth after four tough years. The companies, including Volkswagen Group, Renault-Nissan and Ford Motor, were some of the hardest hit by Russia's economic downturn, in which annual car sales more than halved from a 2012 peak of almost 3 million vehicles, and a sharp devaluation of the ruble raised prices for imported parts and sapped profits. But Russian car sales are now forecast to grow by 4 percent in 2017, according to the Association of European Businesses lobby group. Five of the world's biggest carmakers operating in Russia, which had a combined market share of around 38 percent last year, told Reuters the stronger ruble had improved their position in the country. This will help them to cope in a challenging and volatile market once seen overtaking Germany as Europe's biggest for automobiles. "The ruble fluctuation is of course difficult in all directions. When it was shooting up or weakening like hell over the last few years we had difficulties ... we lost a lot of money there," Marcus Osegowitsch, head of Volkswagen's Russian business, said. "Now of course the ruble is stronger again and we are managing. If it stays somewhere between 65 and 67 to the euro, this is fine for us." The ruble has gained 8 percent against the dollar and 6 percent against the euro so far this year, supported by higher oil prices and Russia's nascent economic recovery. Year on year, the Russian currency is up almost 20 percent against the dollar. General Motors quit Russia in 2015, partly due to the ruble devaluation, but industry analysts say those foreign players who have stuck out the crisis years could soon see their local operations return to profit. "Foreign producers who suffered losses over the last two years now have the opportunity to return to profit thanks to the stronger ruble," VTB analyst Vladimir Bespalov said. "This could happen by late 2017 or early 2018." Ford, which is enjoying an unexpected uptick in sales in Russia, has already lowered prices on four models produced by its joint-venture with local partner Sollers due to the ruble strengthening. Competitors will similarly try to keep prices low, Bespalov said, in an effort to win back cautious buyers. Representatives for Kia and Renault, which owns a majority stake in Russia's top automaker AvtoVAZ along with its alliance partner Nissan, said the ruble’s improved performance in 2017 was supporting sales and the market recovery. "In the long term, the stronger ruble will positively affect our profitability," a Nissan spokesman said. AvtoVAZ's production costs are less exposed to currency fluctuations than those of foreign carmakers, as the majority of its car components are produced domestically. "In the last few months, the situation with the ruble rate has become more predictable, which has affected the behavior of our clients," a Toyota spokeswoman said. "We are seeing a renewed readiness to buy a car."